Le Corbusier was born on October 6, 1887 in Switzerland. He was an architect, designer, urbanist, and writer. He was one the pioneers of what is now called modern architecture. Corbusier was born Switzerland and became a French citizen in 1930. In about 1907, he travelled to Paris and found work at the office of Auguste Perret’s, the pioneer of reinforced concrete. 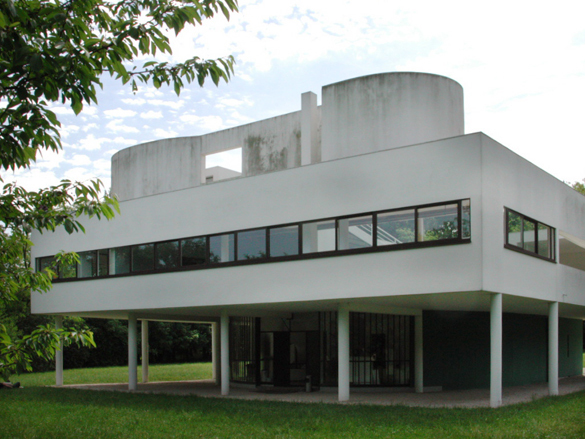 Corbusier taught at his old school La-Chaux-de-Fonds during WWI, and didn’t return to Paris until the war was over. During these four years in Switzerland, he worked on theoretical architectural studies using modern techniques and among these was his project for the Domino House. This model proposed an open floor plan consisting of concrete slabs supported by a minimal number of thin reinforced concrete columns around the edges, with a stairway providing access to each level on one side of the floor plan. This design became the foundation for most of his architecture for the next ten years. Between 1918 and 1922, Corbusier halted plans relating to architecture and concentrated his efforts on Purist theory and painting and in 1922 he opened a studio in Paris with his cousin Pierre Jeanneret. For a number of years French officials had been unsuccessful in dealing with the squalor of the growing Parisian slums, and Corbusier sought efficient ways to house large numbers of people in response to the urban housing crisis. It was Corbusier’s Villa Savoye that most succinctly summed up his five points of architecture that he had elucidated in the journal L’Esprit Nouveau and his book Vers une architecture, which he had been developing throughout the 1920s. Corbusier explicitly used the golden ratio in his Modulor system for the scale of architectural proportion. He this system as a continuation of the long tradition of Vitruvius, Leonardo da Vinci’s “Vitruvian Man”, the work of Leon Battista Alberti, and others who used proportions of the human body to improve the appearance and function of architecture. Also, in addition to the golden ratio, Corbusier based the system on human measurements, Fibonacci numbers, and the double unit. On August 27, 1965, Corbusier suffered from a heart attack and was pronounced dead. Corbusier’s death had a strong impact on the cultural and political world. Homages were paid worldwide and even his artistic enemies recognized his importance. Sitting in the Outskirts of Paris, France, the Villa Savoye makes use of pilotis, which elevate the rest of the structure from the ground. It also uses load-bearing walls, which allow more space for the interior.